Twenty years since the events of Clockwork Watch: The Arrival and Great Britain has gone through an astounding transformation. Clockwork servants are all the rage – but not in the way the government planned. Unemployment, Clockwork prostitution and anti-Clock violence is at an all-time high. And at its crackling centre, a bitter and angry Janav Ranbir wants to tear it all down. Employed by a new government organisation designed to police Clocks, Janav starts on a path of destruction against the mechanical servants. 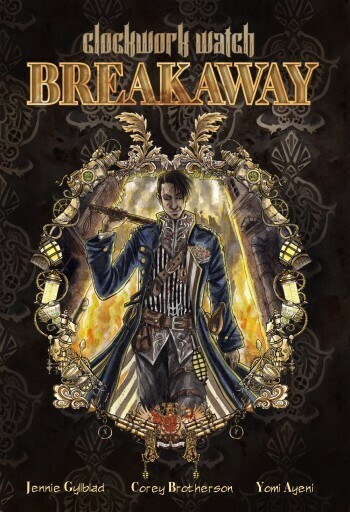 Breakaway is the second book in the Clockwork Watch story. The project is an interactive narrative told through live events, graphic novels, online, role-play and film. Breakaway is written by Yomi Ayeni, edited by Corey Brotherson, and art is by Jennie Gyllblad.